Boredom is the only reason you're on uncyclopedia, and the only reason I edited this crap. It's also a disease which causes you to be really fat and stupid so if you want to get bored play tower defence upgraded. It has a wide range of symptoms, which may differ from case to case. The disease (Boredom) was genetically engineered in the 16th Century. Many societal ills blamed on video games and popular culture are in fact caused by boredom. Philologienne and dinosaur huntress Marie Curie wrote of this in her landmark work Frankenstein, or, a Modern Narcissus in 1847. Since Curie's paper on the subject was so boring, her conclusions went unread until 2003, when a tenacious reader finally discovered the end of the paper. Curie's research was reprinted in a more interesting form in 2004, as part of the scholarly journal Chicken Soup for the Pacific Rock Sole, but the findings were attacked as "19th century bourgeois burqa-enforcing silver-spoon eugenics" and "A slap in the face to what used to be a perfectly snarky field of study" by spokespeople for the SPCA and the NRA (respectively). Other activists thought about joining in the debate, but all sides agreed to give up since the subject was so dull. This pathetic compromise and attack on scientific study was accompanied by self-satisfied chuckles all around. Initially, there is a tendency towards inactivity, a condition which may take hold of a person for as little as a few minutes, or as long as an entire lifetime. This is often followed by nervous habits, such as biting nails, tapping, cracking knuckles, staring, fantasizing, stalking, denying that you were stalking, tapping, taking a bite out of an already half eaten doughnut you see laying on bob's desk, getting herpes from said doughnut, tapping, scratching, making a list of the order in which you would kill everyone if you were a psycho that would do that kind of thing, tapping, bashing your face repeadedly against your desk while uttering curses and profanities at the clock, and getting fired because your boss thought you were talking about him. Boredom has been shown to affect the time lobe, the part of the brain that moves time forward. For an individual infected with boredom, time will laugh at you, and make fun of your mom. School will seem to stop.This simple state of being "bored" may lead to all kinds of complications. While boredom itself is a nonfatal disease, when a person is bored his or her brain is weakened and more often susceptible to more dangerous ailments such as Stupidity (Morbus Stultissimus) and Grammar (M. Verbosus). If you or someone you know is suffering from boredom, contact your Scientology Space Opera House immediately. Side effects: increase in intelligence and creativity, loss of money, anarchy, suicide. Side effects: fatigue, anxiety, loss of limbs And euphoria. 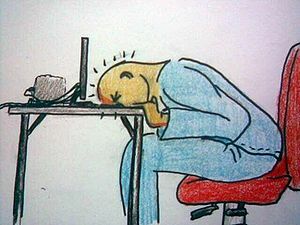 Drowsiness Is also a common side effect. Making plans to conquer the world. Contraction of the "Apple" disease. A vaccine for boredom is under development. (There is one known vaccine, massive amounts of drugs, hookers and blow, Oxycontin, caps of Ecstasy and if that doesn't work 10 hours of cod 6 will help. this method to alleviate boredom can be quite dangerous however. most individuals with chronic boredom will do anything to fight it including getting real high.) So far, all test subjects have turned inside-out. Despite this, the FDA has projected a version of the drug will be available to the public by tomorrow. It is taken in the form of a suppository 10cm in diameter (5mg dosage) twice a day for 3 weeks. This page was last edited on 17 June 2018, at 20:12.